When a non-resident of the US sells US real estate, the title company must hold-back 15% of the sales proceeds. This is in accordance with the Foreign Investment in Real Property Tax Act (FIRPTA). However, if the buyer intends to use the property as a personal residence and the selling price is less than $300,000, then no taxes will be withheld from the sale. Let’s take the example of Bustin Bieber, a Canadian tax resident who is selling his vacation property in Orlando Florida for $1,000,000. A withholding tax of 15% or $150,000 will apply to this sale. Bustin purchased the property in 2007 for $900,000. Bustin would like to reduce the taxes to be withheld. 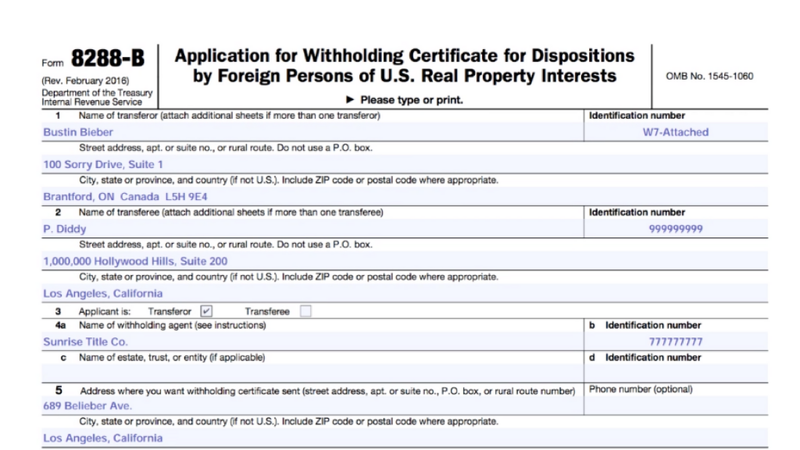 He can do this by completing form 8288-B, Application for Withholding Certificate. Enter your name and tax identification. 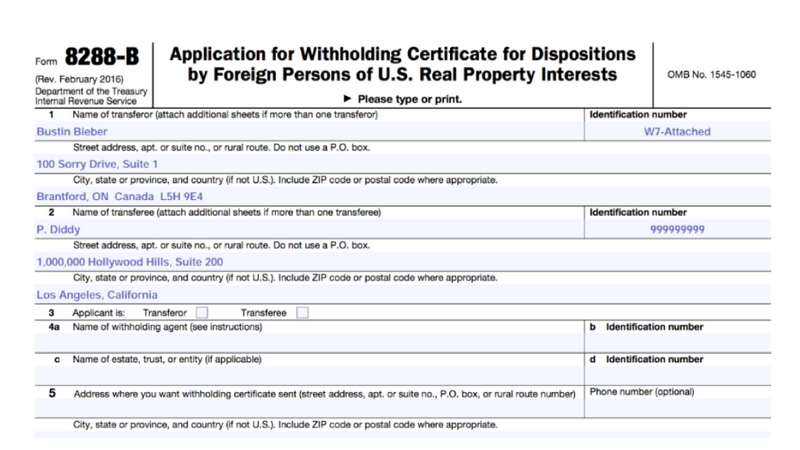 If you do not have a US tax identification number, then you must attach form W7, Application for an Individual Taxpayer Identification Number to form 8288-B. Enter your home address in Canada. Check the box for transferor. The transferor is the seller and the applicant. Enter the name, Tax Identification Number, and address of the title company. The title company is responsible for withholding taxes from the sales proceeds. 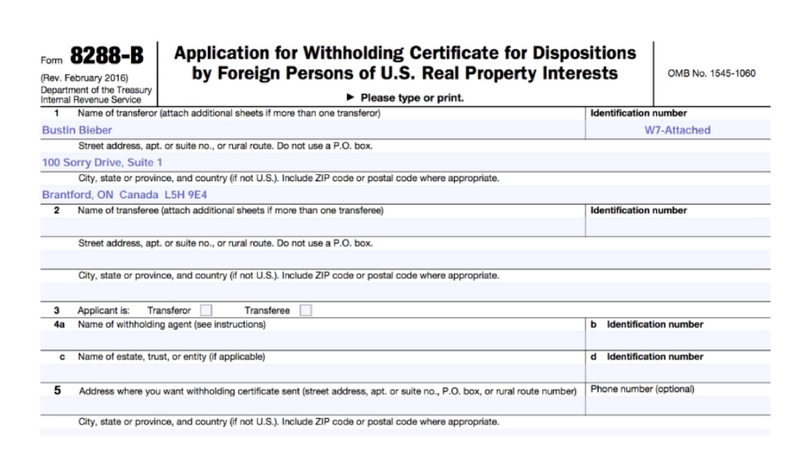 In addition, the title company should receive the withholding certificate from the IRS. Report the Adjusted Cost Basis. This is the purchase price, plus the cost of improvements made to the property and closing costs paid when you originally bought the property. Report the address of the property being sold. 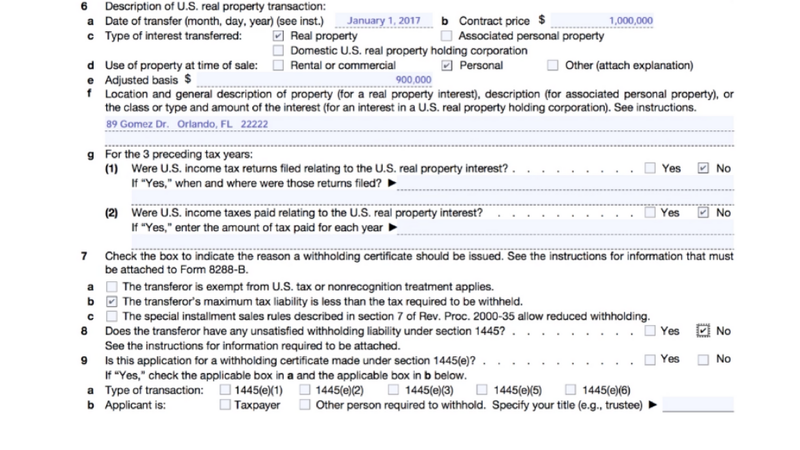 Check “No” for “filing returns” and “payment of taxes”. 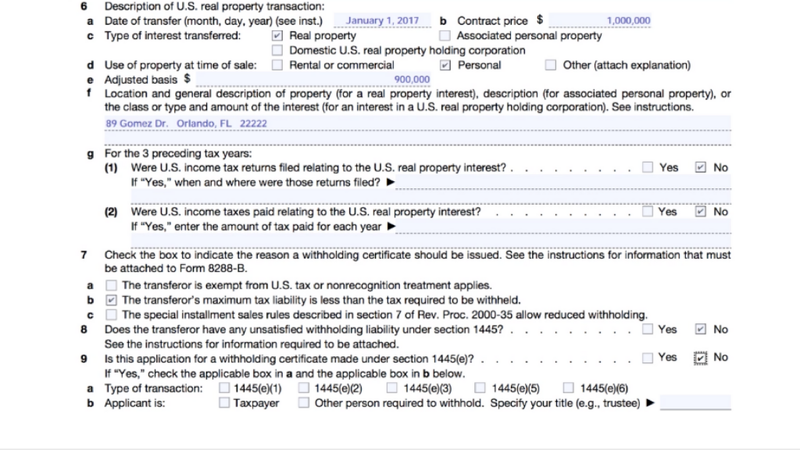 Since this is Bustin’s personal property, he was not required to file US tax returns nor was he required to pay US income taxes. 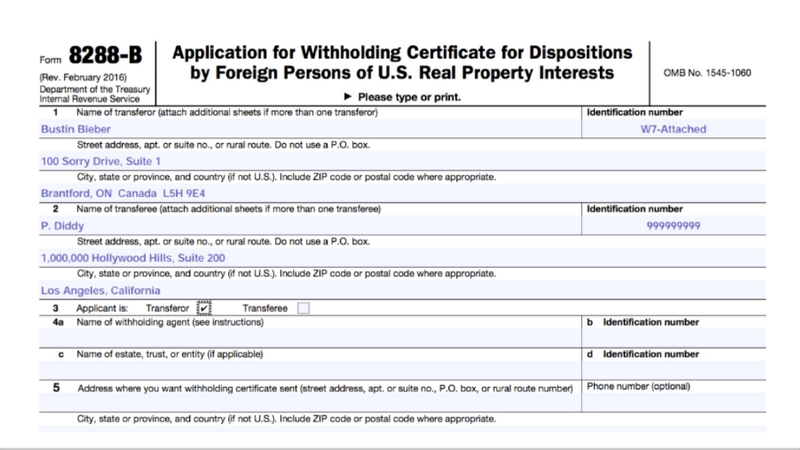 You have to provide a valid reason why the IRS should issue a Withholding Certificate. 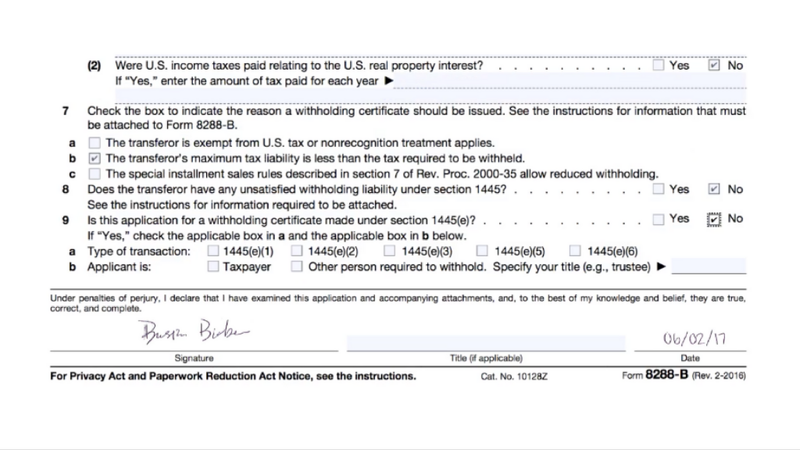 In this case, check box 7(B), because Bustin’s tax liability from the sale is less than the taxes to be withheld. Bustin’s tax liability is $8,139. 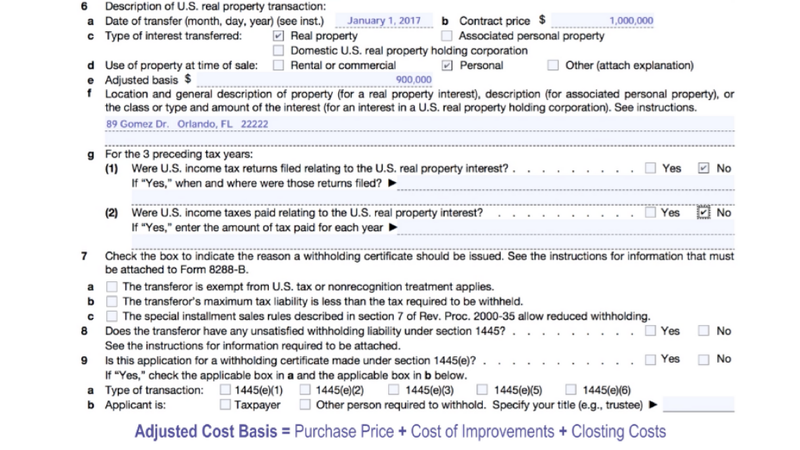 You can use a personal tax calculator to estimate the US income taxes payable arising on the sale of your property. However, the taxes to be withheld are $150,000 or 15% of $1,000,000, which is the selling price. 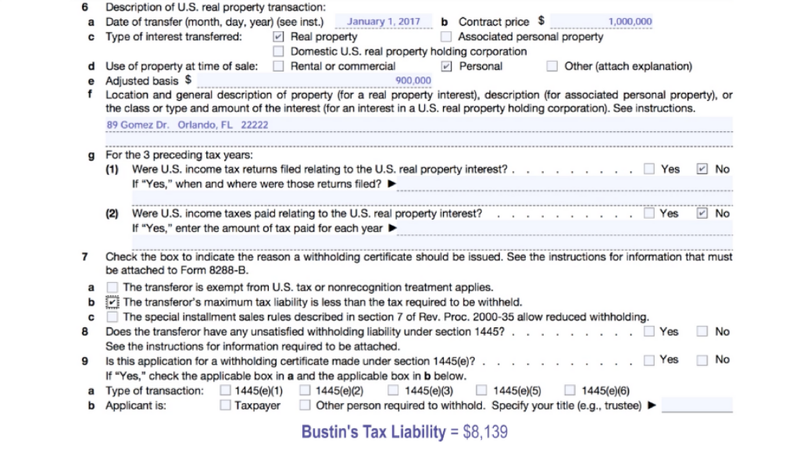 Since the estimated income tax liability of $8,139, is less than the taxes to be withheld, Bustin has a valid reason to request the IRS to issue a Withholding Certificate to him. Once the withholding certificate is issued by the IRS and provided to the Title Company, the Title Company will only withhold the estimated income tax of $8,139 and remit this amount to the IRS. The rest of the funds will be released to Bustin, i.e. $991,861 ($1,000,000 less $8,139). Since this application is for an individual taxpayer instead of Corporation, Bustin would check “No”.